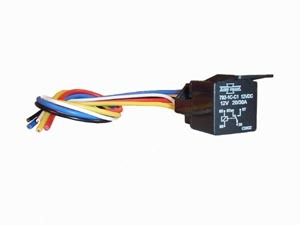 Relay kit to be used with any switches that are controlling an electric motor such as an electric fuel pump, electric water pump, or cooling fan. High pressure fuel pumps, cooling fans, water pumps, and ignitions require full voltage for proper operation. Long runs of wire allow voltage to drop resulting in a decline in performance. Using this relay kit will eliminate the voltage drop allowing your components to work properly. This relay kit should be used whether you have a street car or a race car. You can find similar kits available through Summit racing, Jegs or other mail order high performance parts places for around $23.00. You can own this kit for much less!!! This relay is 40 AMP, 12v and 16v compatible. Kit comes with a relay, wiring harness and basic fan wiring diagram. Click on the "BUY NOW" button to purchase from this website. You can purchase your item with a credit card on a secure site when you click on the buy now button below. If you do not currently have a PayPal account you can use a credit card for your purchase.